Red Rauthim, adventurer and ruler of the city Erastavim, decided to right a wrong from his past. 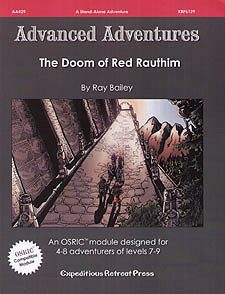 Nearly twenty years ago, Red and his adventuring party learned of the location of a great fire giant temple. Ever one to see a golden opportunity, Red thought it a great chance to slay some of the most wicked creatures to walk the worlds face and relieve them of their treasure. However, they met their match when the head shaman, Thjazi-Loki, roared and charged into battle. Red's outmatched party soon turned to flee. Heroically the party's priest, Father Ferrio, drew the giant's attention and the last thing Red saw was Ferrio cut in half by the giant's great broad sword. For the last twenty years, Red Rauthim has felt guilty that his friend gave his life so that Red may live. Feeling his age upon him, Red left his city 6 months ago to personally kill Thjazi-Loki out of respect for his fallen friend. But Red has not returned, although divinations ken he is still alive. You and your party have been hired to find and return him to his city, even if that means bearding a fire giant temple.